While the Ethiopian government boasts that the country can soon be categorised as middle-income, economic analysts are more cautious saying that the country has made "significant progress". ADDIS ABABA , Feb 21 2012 (IPS) - Ethiopia says that the double-digit economic growth the country has experienced over the last seven years has started benefitting its majority by boosting their income and productivity in agriculture and small-scale businesses. While the International Monetary Fund and the World Bank state that the country has registered 8.7 percent GDP growth, the government claims the economy has grown by 11.4 percent. However, the country was declared the second-fastest growing economy in Africa for 2011, after Ghana, in the annual economic report by the United Nations Economic Commission for Africa (ECA). In the past, Ethiopia has made headlines for recording some of the worst famine situations in Africa, and for its poor health indicators – it has posted one of the highest maternal mortality rates in the world. In 2005, 871 women died per 100,000 live births. But this is slowly changing as the government has made progress in the provision of social services such as health, education and infrastructure. “In 2010, Ethiopia continued to register the fast growth, as it has for the last five years. GDP growth in 2010 remained strong at 8.8 percent. Growth is driven by the service sector (14.5 percent), followed by the industrial (10.2 percent) and agricultural (six percent) sectors,” the ECA report indicated. In an exclusive interview with IPS, State Minister of the Office of Government Communication Affairs, Alemayehu Ejigu, said Ethiopia has registered remarkable growth by increasing major crop production from 11.9 percent in 2005 to 18.08 percent by the end of 2010. People’s lives are changing for the better in rural and urban areas because of health facilities and infrastructure development, he said. Ejigu attributed the success to the effective implementation of the national five-year Growth and Transformation Plan (GTP). He said that the country’s GTP for 2011 to 2016 would help Ethiopia join the grouping of middle-income countries. Ejigu also told IPS that the government planned job creation opportunities through the construction of 73,000 kilometres of rural roads. “This would create an opportunity for farmers to easily transport agricultural products to market,” Ejigu said. Abeba Bezu, an economic affairs consultant in Addis Ababa, said that under the country’s ambitious Plan for Accelerated and Sustained Development to End Poverty government had reduced poverty from 38.7 percent in 2005 to 31 percent five years later. However, assistant Professor Teshome Adugna at the Economics Department of the Ethiopian Civil Service University cautioned that as GDP considers the market value of goods and services, it cannot be a perfect instrument to show the country’s actual growth, given Ethiopia’s poor record handling and management systems. “Since the GDP reporting does not provide information on who produces how much, it is difficult to know how individual citizens benefit from the reported growth,” he said. Adugna described Ethiopia’s growth as “broad-based”, which he attributed to the growth of the agricultural, industrial and service sectors. Ten years ago, only two thirds of Ethiopians had access to healthcare services, leaving another 68 million people across the expansive rural areas in dire need. “Since 2004, the Ministry of Health has expanded access to healthcare through the Health Extension Programme (HEP), which targets the rural population,” said Amanuel Ayalew, a volunteer health worker in northern Ethiopia. As a result, Ethiopia’s country report by the Department for International Development (DFID), the United Kingdom’s government department responsible for promoting development and poverty reduction, revealed that the impact of the health programme is notable since HEP reaches nine million households. DFID will spend an average of 524 million dollars per year in Ethiopia until 2015. With more than 35 million insecticide-treated bed nets for malaria, there has been a 73 percent reduction in malaria cases. This, coupled with a massive and consistent vaccination programme for children under five against killer diseases, has seen deaths in that age group reduced by a significant 62 percent in villages with access to HEP. There are now about 1.4 million more women on contraceptives than there were in 2005, and the gross primary school enrolment rate has risen from 91.3 to 96 percent between 2005 and 2010. “In spite of a constituent economic growth of double digits in the last five years with economic analysts projecting a similarly impressive growth, sustainable growth and poverty reduction remains a challenge,” Bezu said. A majority of rural poor are still grappling with severe climate change and are still highly susceptible to drought. It is a situation that government partially acknowledges. “When we say the country is growing it does not mean that every citizen has no problem…even in the United States there are people who are provided with food aid,” Ejigu said. He, however, added that no one would die of starvation as there would be no food shortages in the country. It is a view that the leader of the opposition Ethiopian Democratic Party, Mushe Semu, does not agree with. “Ethiopia is a country where many citizens are starved. It is not a question of having food two or three times a day,” Semu told IPS. He said it was impossible for Ethiopia to become a middle-income country. “When we think of the majority of the Ethiopian population we are talking about our farmers and rural communities that are 85 percent of the people. Here, the land management and fertility should be considered,” he said. He said that without effectively distributing all arable land to people, and with the prevailing land degradation, it was not possible to bring about development. The country is not conducive for private sector growth, analysts say. “Although the government envisions a private sector led development, the environment is not conducive for the growth of the private sector. 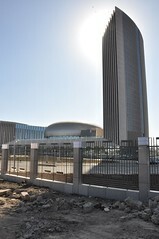 In fact, private investment as a percentage of GDP has remained on the decline since 2004,” Bezu said. In a World Bank global survey dubbed Ease of Doing Business, in 2010 and 2011 Ethiopia ranked 103 and 104 respectively out of 183 countries. But meanwhile, civil servant Abiy Getahun said that the double-digit economic growth repeatedly propagated by the government media has not yet brought the desired social development to his life. He cited the low wages paid in Ethiopia, which, according to him, are low compared to the rest of Africa. In the 2011 U.N. Development Programme’s Human Development Report Ethiopia ranks 174 out of 187 countries worldwide. He said that most people, especially urban dwellers, could not withstand the skyrocketing price of good and services. * Additional reporting by Miriam Gathigah in Nairobi.